The myth about cats having nine lives can somewhat misleading at times. Especially for the first time cat owner, sometimes they need a little human help in order to keep their impressive reputation in tact. That is why it is useful to have a basic grasp of feline first aid just in case. 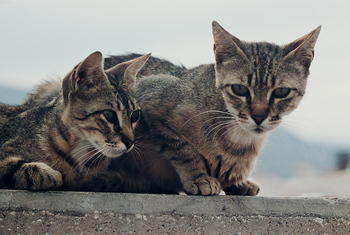 Two of the most common feline injuries involve cars and electrical wiring. Cats are inquisitive by nature, especially kittens and can often be found exploring behind the television or on the window ledge. As with most injury related dilemmas, prevention is by far the beast cure. So supposing you have taken all of the precautions you conceivably could and yet your cat still manages to get her teeth round the T.V. cable, what do you do? In most of these cases where a cat has been hurt or injured, the chances are she will be in shock. Always approach the cat with caution. Do not make undue noise and do not rush up to her as this could well scare her into causing herself more injury. It is advisable to have something handy with which she could be restrained, a cloth or even a t-shirt, is sufficient. If you manage to cover her eyes up she will be slightly less aware of the commotion and subsequently more calm. The next step is to get her to the vet. Before you jump in the car, try to assess the injury. Could there be a broken limb or a deep laceration? In an emergency always call the vet to let him or know that you are on your way so that the right preparations can be made to treat the cat properly. When lifting a potentially injured cat, do it gently by the scruff of the neck. Also support the cat’s bottom. This will avoid adding pressure or tension to potentially broken skin. Be sure to avoid twisting or bending the spine as this could add more sever injury to an already injured bone. When you have successfully removed the cat from any further danger, it is imperative that you keep her warm. This is to avoid her going into further shock. If she goes into shock she could suffer a cardiac arrest. This is more common in cases where the animal has suffered an initial shock such as a burn or an electrical shock. Keeping the head lower than the rest of the body always help reduce the risk of shock as more blood flowing to the brain aids quicker recovery. Is your cat often getting herself trapped? It might appear so but this can be misleading. A cat would happily spend a whole day up a tree before she decides to come down for dinner. Leaving a strong smelling food at the bottom and then vacating the area is the best way to encourage her down, tuna is always a safe bet. Human interference in these situations often results in the cat getting scared and vacating the tree via the quickest possible way down, just hope the branches brake the fall! What if she really isn’t able to get down herself? Get a ladder and slowly and calmly approach her and gently pluck her from her predicament to safety. Check for injuries and keep her warm. For more serious injuries like a flesh wound, human first aid and common sense are the best ways of helping. Pressure to the wound stems the blood flow and blood loss. Keeping the wound above the heart slows down blood loss, then get her straight to the vet, do not waste time by trying to clean the wound.